"Often times our first interaction with a brand is through a digital touch point like a site. Maybe we heard about it from a friend or somewhere else. We interact with it—we give it a try. If we like it—that leads to deeper levels of engagement. Maybe this repeats itself adding more "cycles" to the spiral. We continue to engage. Some of us even begin to participate. We transition from downloading to uploading our media. We talk about how great the experience is. To our peers, to each other. We become evangelists—the spiral actually expands as we engage with multiple touchpoints—not only the digital ones." And now I'm wondering if the disappearance in of the funnel in traditional marketing will lead to the emergence of another kind of funnel—"fuzzy funnels" that blur together vastly difference disciplines, backgrounds and services that come together to result in how we think and feel about brands, products and services. It hit me at MIX 08. Like a brick actually. Sure there were different tracks. A "UX" track, a "Business" track and everything else seemed like it was for developers, both software and Web. But aside from the tracks—it was clear that MIX was primarily about technology. That was the gig. Now some gatherings may be focused on marketing. 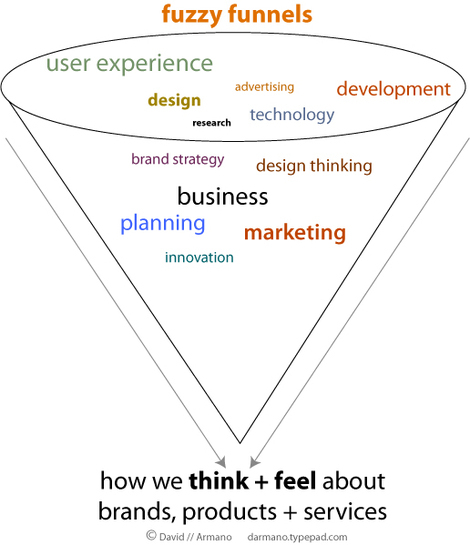 Others on the intersection of technology and marketing and yet others on design, or business or both. But the reality is that we're still taking different languages. At MIX 08 the vernacular was about "platforms", code and the latest break through in technology . When the word "brand" was mentioned, it seemed almost unnaturally out of place. On Madison Ave. it's the opposite—brand leads the way while technology is often an afterthought. But what the "fuzzy funnel" shows us is that we're all going to get mixed up in a blender whether we like it or not. Because it's the convergence of all these things which lead to how we think and feel about brands, products and services that really matters. It's why media companies want to act like technology companies and vice-versa. And that giant blender is where it's going to get really interesting. So, will we see more people "talking in brand" at MIX 09? Possibly. Will we see more geeks and developers at Cannes? That's possible too. And when it happens—when you're at an event where you feel like your surrounded by people who look like the multiple ingredients of the fuzzy funnel and then some—then you know on to something really interesting. We're all heading toward the same destination, even though we're speaking different languages and living in complimentary cultures.